Each cross bookmark favor measures 5.5" x 1.5". Each features a dangling, detailed, cross charm in pewter colored poly resin with an inlaid ivory design and sparkling clear rhinestone accents. 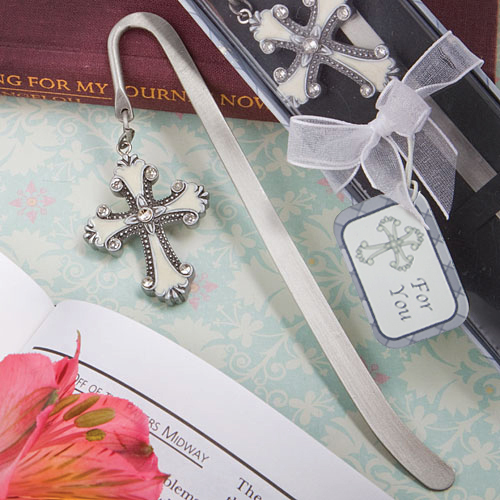 The charm dangles from a unique silver colored metal long stem petal design page marker that is intended to slip into the book at the page you want marked, while the decorative cross is visible from the outside. Very attractively packaged sitting on top of a black staging insert, in a clear topped two piece box with a gray and silver argyle and ivory cross design base. Box is then wrapped and tied with a white organza ribbon and an attached "For You" tag with a matching cross design.